When she was engrossed in teaching, Mme. Volkova was the most unself-conscious person I have ever known. In the most pure meaning of the phrase, she lost all consciousness of herself in her concentration on her students. Her beautiful, expressive face, always vitally alive, showed no emotion at all as she de-coded the dancer before her and planned her strategy for coaxing, prodding, revealing a dancer’s ultimate potential. And when the battle was launched she poured her enormous and enthusiasm into us with a generosity that knew no bounds. I met Mme. Volkova in 1950 when I was eleven years old. My family lived in London for a year and my foresighted father considered it important enough for me to study with Volkova that I had a private tutor instead of going to school. It was an exciting time at West Street; dancers from the Royal Ballet, the Sadler’s Wells Ballet and many touring companies filled her morning classes. During their season at Covent Garden, virtually the entire New York City Ballet came to her, for which I don’t think Mr. Balanchine ever forgave her. In some ways I might have been better off in classes with my own age group but I gained an education I could have found nowhere else. She allowed me to take any class she taught and invited me almost daily to attend her private coaching sessions with a constellation of ballet stars – a tiny person in the corner, watching her every move, listening to her every word. Whenever she had time she quizzed me after a class or rehearsal about what I had seen, what I had learned to take with me forever. 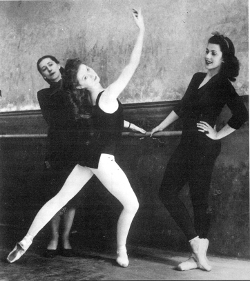 The logical beauties of good ballet technique were laid before me and explained over and over in her classes and her rehearsals, demonstrating the infinite refinements for which great artists strive, even in roles they have danced for years. Above all, her example taught me how knowledgeable, energetic, demanding, loving and utterly selfless a great teacher must be. When my family was ready to move back to California, Mme. Volkova and Mr. Williams requested a meeting with my parents. After what must have been very serious discussions, they had made the decision that they would like to adopt me. Of course my parents did not agree but the offer was very much appreciated and I wondered for many years how different my life would have been. When I joined the New York City Ballet in 1956 we went almost immediately on a European tour which included Copenhagen. I had heard that Mme. Volkova was ill and inquired very hesitantly if I might see her. To my surprise, the word came back that she would like me to visit her in the clinic near the Royal Theatre where she was recovering. The memory I have carried all these years is almost like a de la Tour painting: a small, dark room, brightened only by the warm glow of a low lamp, and with a single chair which she directed me to draw close to her bed. She looked small, lost and surprised by her ill-health but, typically of her, she wanted endless details of my life since we had last seen each other - with whom had I studied, how did I like my new job, what ballets was I performing, and how were my lovely parents? It wasn’t a long visit, I don’t suppose, and I may remember it through a coloured prism, but it remains one of the most vivid memories of my life. I left filled with love for her and for the art we both served and terrified that I might never see her again. But we did meet again – a number of times – on tour once again in 1962, this time with Jerome Robbins’ Ballets USA and, for an extended time, when I staged Symphony in C for the Royal Danish Ballet in 1973. By the last visit I was myself a teacher, ballet master and artistic director and watched Mme. Volkova work from a quite different perspective. Observing her teach was more of an enlightened joy than ever and I had the great pleasure and honour of spending several evenings with Mme. Volkova and Mr. Williams in their apartment where we ate good food, drank lovely wines and I could ask her every question that had burned in my brain. The only downside was that I felt quite unwell and could barely enjoy the good dinners. She was concerned, of course, and determined that what I needed was porridge so every day before my rehearsals began, I was presented with a thermos of hot porridge which I valiantly attempted to eat only to please her. Eventually I realized that my “upset stomach” was announcing the imminent arrival of my third son – but the porridge continued. I guess it was good for him and for me because he has become a mighty man. In 1988, when I had the honour of staging the first Balanchine ballet in the Soviet Union and visited Saint-Petersburg for the first time, I felt not only that I was bringing Balanchine back to his homeland but that, in a vague sense that was yet very important to me, I was also visiting for Mme. Volkova. I could picture her in her white uniform at the Smolny Institute for young gentlewomen; I felt her with me as I worked with the dancers and teachers at the Maryinsky; and I was proud to be able to present a photograph of her to be displayed in the library of the Vaganova Academy. It was not unusual for her to be with me in spirit, of course. She has been every day since I was eleven years old. I realized many years ago that, as a teacher and as a woman, she has been the ideal to which I have aspired my entire life. Alexander Meinertz’ superb biography was a shock the first time I read it. Apparently I did not want to know that she was as human as the rest of us, that she had flaws, that she was unfaithful to Mr. Williams, whom I also loved. But, on a second reading, I realized how unreasonable I had been to expect her to have walked on water. Wasn’t it enough that she had devoted her life to teaching, inspiring and caring for so many of us, that she had shown us the confluence of art and life that had enriched our lives? I found also, on that second reading, further confirmation that so much of my own teaching had come, in both technical details and in character, directly from her. It is heart-breaking that she did not write the book on technique that she intended, but she would have had little patience with our sadness. Honouring and passing on her legacy is what she would have wished. Keeping her memory alive is a sacred duty for all of us who had the privilege of knowing and loving Vera Volkova.